Our cats are very demanding with food, and we must offer them food that they like while delivering everything they need. In the same way as with hygiene, cats are very demanding with their food and they will reject it unless it is clean, at the right temperature and, of course, in good condition. If, for example, you change the brand abruptly, they may not even try their new food, and they may even reject their usual food if they get tired of it for some reason. In addition, cats don't eat what is best for them; they eat what they like most. That is why owners need to control their diet. There are several options in feeding cats and these can be complemented depending on the circumstances. Cats that go out hunting are not fed in the same way as those who are more sedentary or as others who supplement their diet with some nutrients prepared by their owner. Our cats would appreciate a varied but complete diet. Trying to provide it a balanced homemade diet is frankly complicated, but as a complement to cat food it is ideal. You can give them sausage, meat or fish, baked or grilled, accompanied by some vegetables or rice or pasta. But beware of giving them leftovers: you may not be providing the adequate nutrients and you could cause a weight increase that can be detrimental. 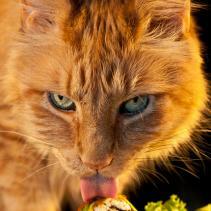 It is best to choose carefully prepared food to provide your cat all the appropriate nutrients. These products are the result of R&D to create specific nutrients for each type of cat, so in a specialised shop you will be able to choose from an extensive range of products. 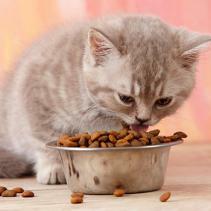 There are three types of cat food, and all three have the same nutritional value. 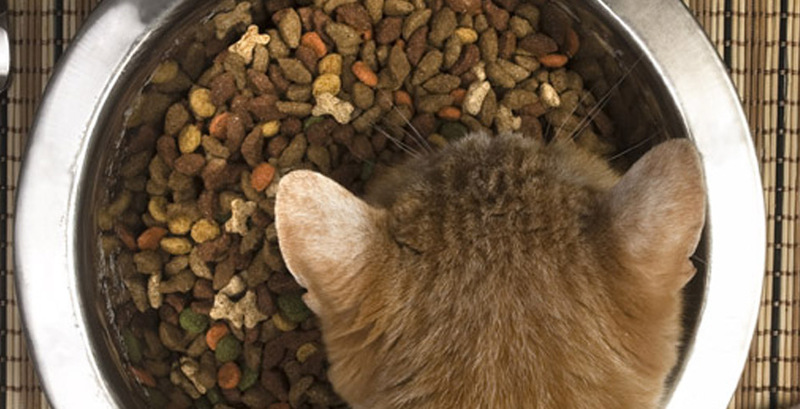 Dry food is the most common and usually the most complete, but you always need to place a generous bowl of water beside the food bowl. In addition, dry food has a feature that usually goes unnoticed: its crunchy texture facilitates the removal of dental plaque. The semi-dry variety contains between 20% and 40% of water and provides, in the same way as the other two, a wide range of possibilities, although it is not usually the most palatable to cats. Wet food is canned. Given that it is gelatinous and tasty, it can be a good reward for cats, but we should not base its diet on this type of presentation: the cat’s faeces and breath will have a stronger smell. Variety is extensive both in pâté and natural, and obviously wet nutrients can only be found based on meat or fish. If your cat is not sedentary and goes outside, it may supplement its diet by hunting mice and other small animals that provide protein, minerals and basic vitamins to its diet. Still, it is important to provide what your vet thinks its body may be missing. Moreover, plants are part of the feline diet, as they are useful for what is commonly called 'purging', i.e. it induces them to vomit, which in this case is good. In conclusion, it is very important to know which nutrients we should give our cat so that it can develop its physical activity without problems and enjoy eating like a good gourmet.